Get a real handle on your event favors with these personalized glass mason jars! 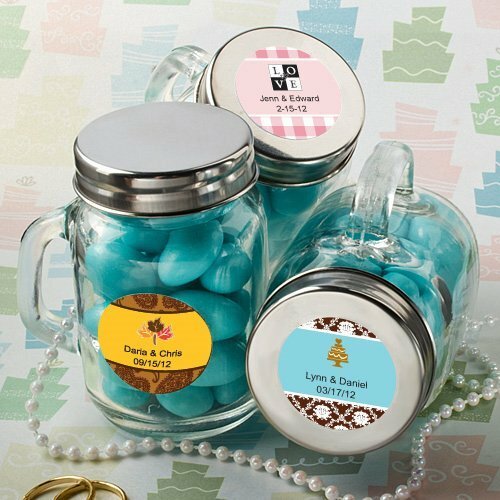 Fill them with your favorite trinket then add a custom label to each one for that extra special appeal! Measuring 3 1/4" tall by 2 1/2" wide (including the handle), each glass jar can hold up to 4 fluid ounces with a screw on silver metal lid. Select from hundreds of color and design combinations for your labels, then easily attach them to each lid upon arrival. The mason jar favors arrive bulk packed. Note: Candy is not included. How do I add my personalizations to the mason jars that I'm ordering? You will see a designer tool/"personalize now" tab after adding this Personalized Glass Wedding Favor Mugs (50 Designs) in your shopping cart. That's where you can design this item and select from different designs we have.